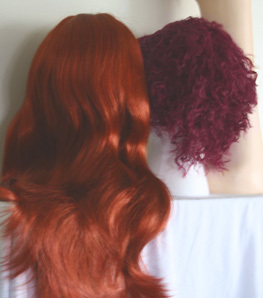 Above to the left is the Linda B wig from New Look in Henna Red. Above to the right is a side by side comparison without a flash in filtered daylight of Henna Red on the left and #39 on the right. In the brighter light the Henna Red looks more copper, in the shade or in the shadows of the wig it looks a bit cooler toned. The photo to the far right was customer contributed - she used the Henna Red wig for her Sally costume and straightened it a bit.